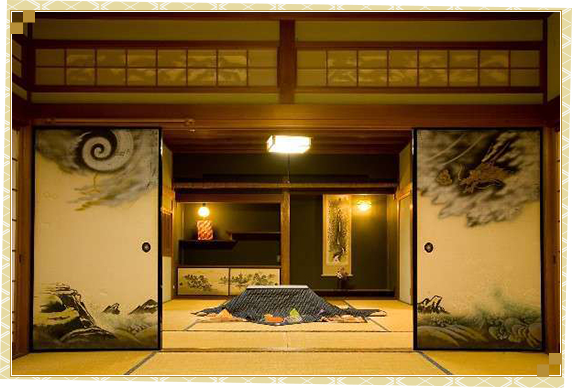 Enjoy a leisurely stay in a timeless traditional Japanese room. 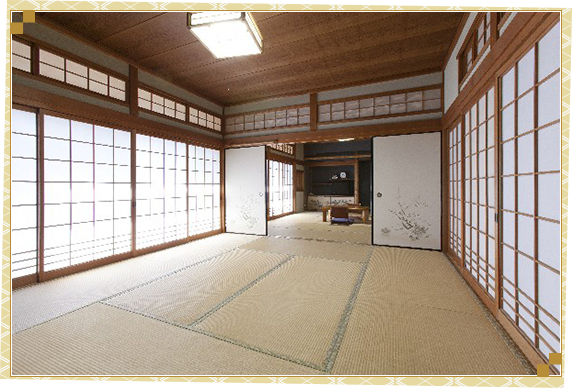 The main building includes a wide variety of room styles, including retro rooms filled with the spirit of an Edo Period inn, twin rooms that resemble each other in every way, rooms that for some reason are fitted with pianos, and rooms in which guests get an entire floor (50 tatami mats) to themselves. Rooms are available for any number of guests. * The shared restrooms, fully equipped with Western-style shower toilets, are located in close proximity to the guest rooms (3–15 seconds’ walk). * Please understand that due to the age of this elegant building (constructed 60 years ago after a major fire in 1954), some rooms may be slightly noisy. * Guests bathe in the inn’s large baths: an enchanting open-air bath and a bincho charcoal bath (available 24 hours/day; availability switches between male and female guests; private bathing available). * Checkout is noon on the next day, so you can enjoy a relaxing stay with no need to hurry. Hanare is a hidden cottage in pure Japanese style, nestled in a quiet spot just a little bit removed from the main building. It has a restroom equipped with a shower toilet. * Hanare does not have a private bath. Please bathe in the inn’s large baths.